Long time no check in, I hope you readers are doing well. This video and song called Follow the Sun by Xavier Rudd brought a smile to my face and inspired me and hope it does the same for you. Lately I am working on taking things day by day and these lyrics really resonated with me. After seeing it I want to take the littles on a spontaneous trip to the beach! I needed this today and hope you enjoy it too... a little "Pep Talk". At a lengthy stoplight during sunset the other day the girls and I sat in silent awe as hundreds of birds danced above us in the sky. It was a magical moment. This bird ballet clip by Neels Castillon is a stunning and a grander scale of what we saw, perfectly paired with the right music . Nature constantly blows my mind. Several weeks ago both my husband and I independently deleted Facebook off our phones and later discussed how it felt like we could breath clean air again. I've heard of others going towards the more minimal social media route and I find it refreshing. I'm not opposed to social media, but there is a fine balance to it, right? This article about going off the Facebook grid really resonated with me to welcome more deliberate living and clearly addressed many of the quarrels I have with it all. 1. Day One : I've teetered back and forth between a digital and handwritten journal for years and have now decided I'm going digital. I will definitely still always have sketchbooks and adore handwritten things but what I decisively love about digital journals is that they are searchable and you can recall experiences, words and notes with ease and speed. 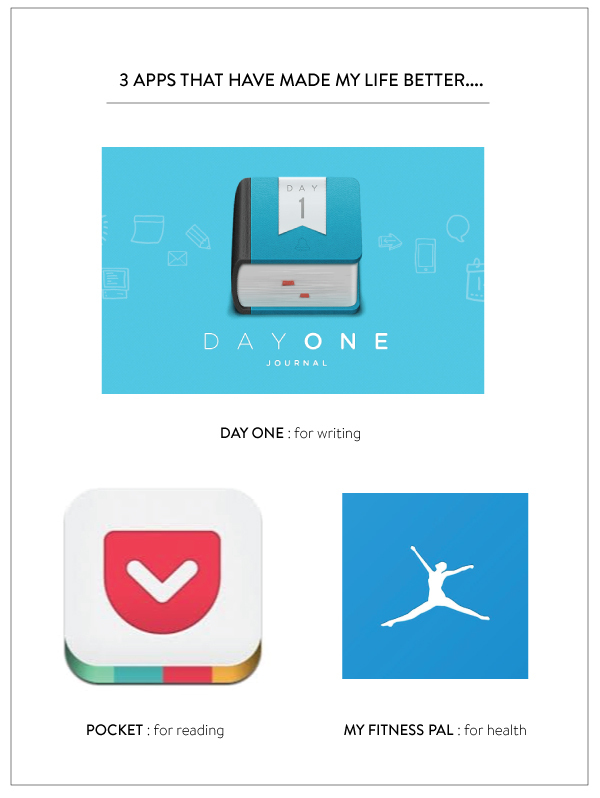 Day One is award-winning and has a well-designed interface with the ability to tag your entries. For example, when my kids say something I want to remember I type it down on my phone really quick and tag their name on it. When I want to take a photo of something memorable and catalog it with words sans Instagram this is what I use. I also bought the corresponding app for my computer and although it has a few kinks (like not being able to tag) I believe they are working on improvements. I adore this on my phone and it syncs with everything seamlessly. 2. Pocket : This app is my go to for clipping articles I want to read later. As I explained to someone the other day it is like Pinterest for words. When I'm craving content with more depth or something to read that is lengthy, Pocket will help me digitally clip and save until I have a bit of downtime to read it later. This app is likewise well-designed with a lovely interface. 3. My Fitness Pal : I am currently doing a 30 day detox (more on that later) and before my cleanse I was really keeping an eye on my nutrition and tracking with this app which showed me what nutrients I lacked. Also (nerd alert) my husband and I wear these and have this and they all sync up flawlessly with app so we can see our activity, weight, and food and nutrient consumption all in one app. We've tried quite a few gadgets, and apps and have found this one to be the best yet at overall health tracking that we've come across. Although my husband now just bought this so we'll see. While I'm on the app subject, have you heard of the trend in app land of waiting lists, ugh. My husband Mac clued me in to get on the list for Mailbox - which supposedly puts email in its place and Tempo - a new calendar app, although when hundreds of thousands of people are in a virtual download waiting line I wonder if it is going to be like a Disneyland wait without a good ride. Thoughts? What are your favorite apps for 2013? Check out this pink Hutt lagoon in Western Australia. It made me do a double take, it is so beautiful especially the artistic way photographer Steve Back captured it. Remember this pink lake I shared here? Well, this one is also a natural occurring algae, nature you blow my mind. You've got to see Steve's other work too, it is stunning. His Pink Lakes series is also jaw-dropping. How great would these be enlarged on a wall for art? Hope you had a nice weekend, I've been listening to some great cover songs all about love in its various forms. 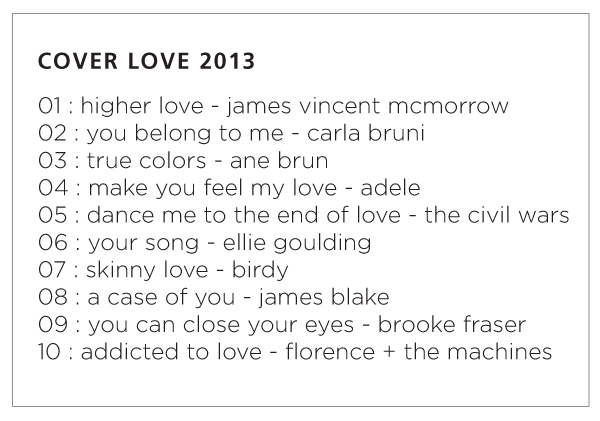 Enjoy this Cover Love 2013 mix, listen to it over here. Dang, it seems like all I use is Spotify these days, what about you? 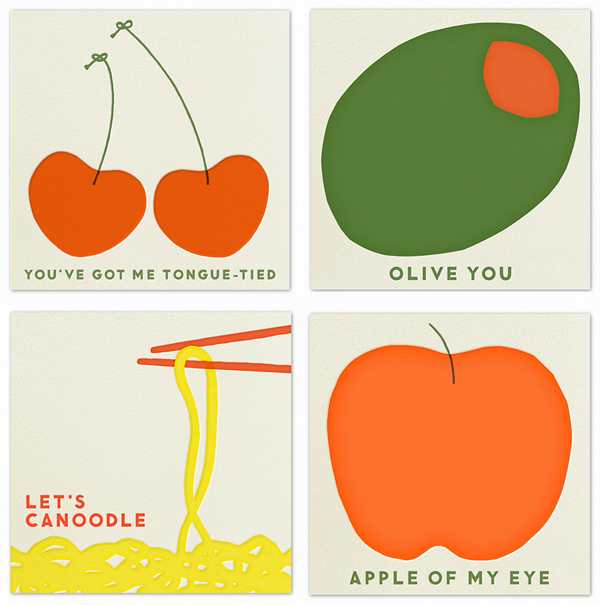 I adore the minimal and graphic work of Erin Jang for The Indigo Bunting and was happy to see her newly designed Food Valentines for this year. They are perfect, check them out here.